Please visit the Hauensteincenter.org This event is free and open to the public. Ethical and effective leadership. Maybe that’s something on your mind these days? Well, at Grand Valley, the Hauenstein Center for Presidential Studies has the mission of nurturing leadership on our campus and in our community. One way they do this is through their free lecture series called Wheelhouse Talks that focus on leadership stories within the West Michigan community. Stephen’s talk will offer the audience so many benefits – both tangible and intangible – that many of us may need these days. 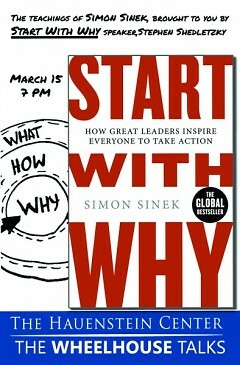 Here are 3 reasons you should make time to attend Stephen Shedletzky’s Start with Why Wheelhouse Talk on March 15. 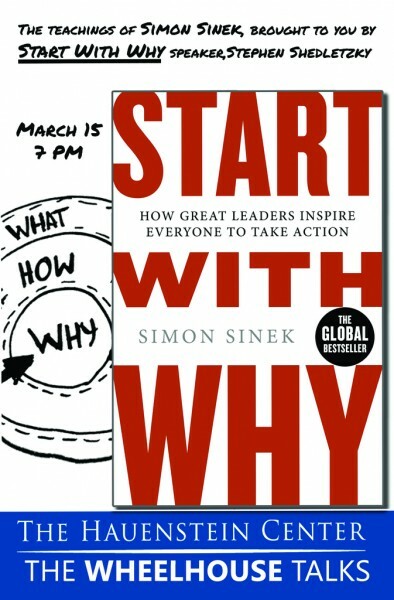 As the founder of his company, InspirAction, and head engagement officer with Simon Sinek’s team at Start With Why, Stephen serves those inspired by the movement to inspire and live in service to others. He speaks, leads workshops, consults and coaches to help leaders and organizations discover, articulate and live their Why–their driving purpose, cause, or belief. Stephen Shedletzky strives to engage people in meaningful ways. He supports leaders and teams as they create environments where their people feel inspired to go to work (and feel safe and valued while they are there), so they can go on to accomplish remarkable things. Stephen inspires leaders to ignite cultures where people feel fulfilled. Stephen graduated from the Richard Ivey School of Business with Honors in Business Administration, focusing on leadership, communication, and strategy. He also co-hosts and co-produces the Start With Why Podcast, Stephen has worked with leading international organizations including Rutgers University, Columbia Sportswear, and Boeing. His list of clients include; the Business Development Bank of Canada, the Ontario Provincial Police, Rutgers University, Travel Alberta, Kimpton Hotels & Restaurants and the Toronto Management Exchange.